The affiliate information page provides you with an overview of your accumulated earnings and other statistics. It also has a button to request pay out. You direct a customer to our site. We give you a URL with a unique code so we can identify which sales are made by you. The URL sets a cookie on the visitor’s computer so we can identify him as belonging to you even if he navigates away and returns later. 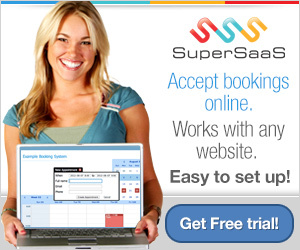 You receive $2 per month from us for every month an account is a regular paying customer, with a maximum of one year. So if a customer chooses a free account and then converts it to a paid service two months later you will accumulate 10 times $2 over a year. 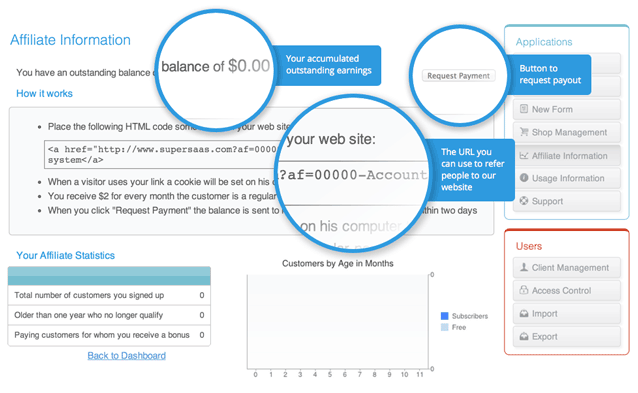 You will be able to check your earnings at any time on your affiliate screen. A new account cannot get the affiliate bonus and receive a reseller discount at the same time. If an account qualifies for both, the reseller discount is applied. You can choose to have your outstanding balance paid out via PayPal at any time by selecting the “Request Payment” button. PayPal may charge you a small transaction fee for receiving the money. All payments are in US dollars. 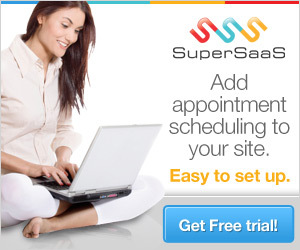 How to promote SuperSaaS on your website? You might want to use some of these promotional images, but of course you’re also welcome to download other images from our site or to create your own promotional material.